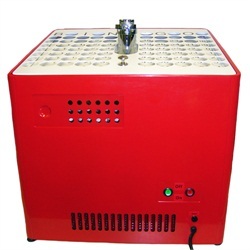 This is a table top bingo console that consists of the blower and masterboard together in a small easy to carry package. This console comes with a set of white double number bingo balls. Windows make the balls visible. When the game is finished, simply lift the masterboard and the balls will roll back into the blower for the next game. Measures 19"x17"x22".